For 2010, the 4.7L V8 engine has been discontinued. The Overland trim has also been discontinued. A power lift gate is now standard on all trims. 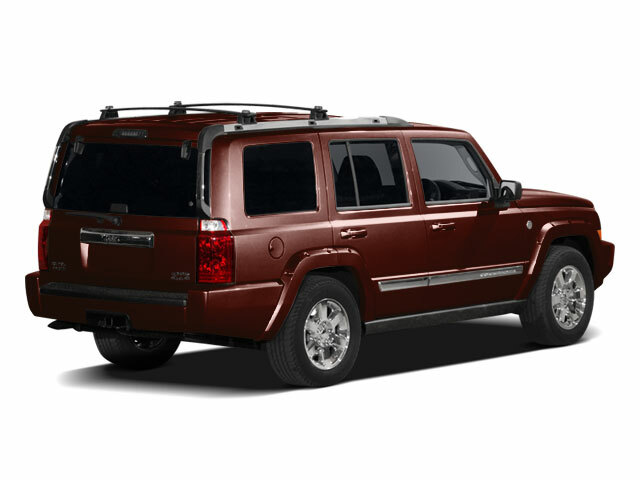 Two trim levels and two engines are offered on the 2010 Jeep Commander. The base Sport trim comes standard with a 3.7L V6 engine making 210 horsepower and 235 pound-feet of torque. The Limited comes with a 5.7L Hemi V8 engine, which offers 357 horsepower and 389 pound-feet of torque. The bigger engine features Jeep's Multi-Displacement System (MDS), which regulates power and improves fuel efficiency by deactivating four cylinders when cruising. All 2010 Commanders come standard with a 5-speed automatic transmission and a rear-wheel drive, with an available 4-wheel drive configuration. The Sport trim gets the Quadra-Trac system, which has a single-speed transfer case and normally splits power 52% to the back wheels, but utilizes the brakes to redistribute power where needed. The Limited gets the more sophisticated Quadra-Trac II system, which has a transfer case with low range that can send up to 100% of the torque to the axle with the most traction. 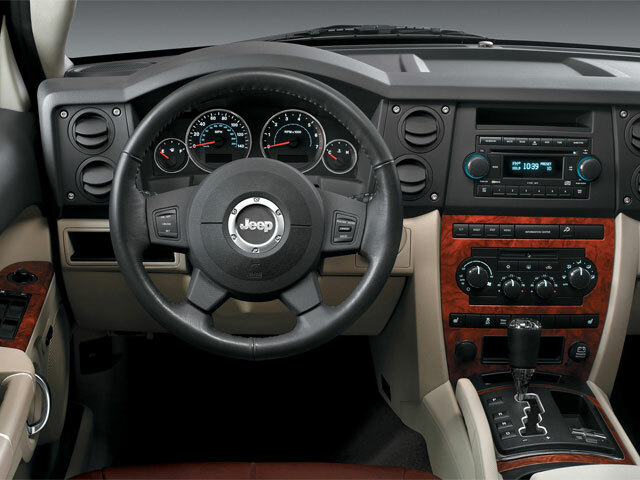 It also uses a Throttle Anticipate feature to sense quick movements of the throttle and anticipate a loss in traction. Available as an option on all trims is the Quadra-Drive II system for hard-core off-roading. It also has a low range but uses electronic limited-slip differentials to smoothly route torque to the tires with the best traction. The center differential can go from completely locked to completely open to maximize traction. The Commander comes with seating for seven, arranged theater-style with the second and third rows higher than the front seats. The 40/20/40-split second-row seat folds flat and allows easy entry and exit to the third row, which also folds flat and is split 50/50. Standard safety features on all trims include all-row side-curtain air bags, front-impact air bags, anti-lock 4-wheel disc brakes with brake assist, electronic stability control with roll mitigation and trailer sway control (on trims with the tow package). 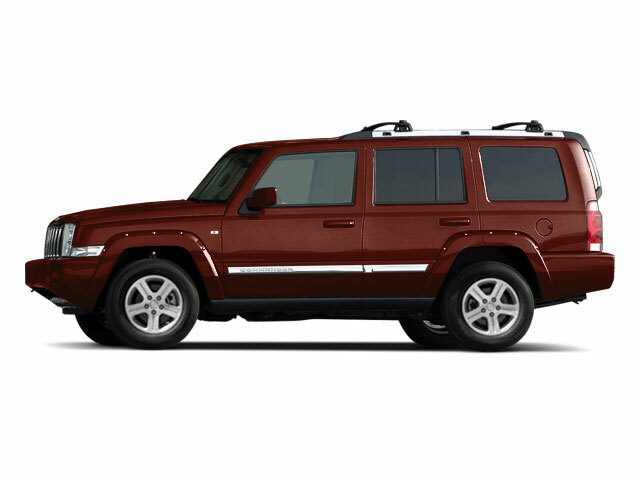 In federal government crash tests, the 2010 Jeep Commanders received five stars out of five for driver-front and passenger-front crashes. Standard on the Sport trim are 17-inch alloy wheels, heated exterior mirrors, fog lights, roof rack, power accessories, an 8-way power driver seat, rear parking sensors, and a 6-speaker CD/MP3 with auxiliary audio jack and satellite radio. Options include touchscreen navigation, heated front seats, leather upholstery, rearview camera, sunroof, Bluetooth and upgraded audio with a 30-gigabyte music server and iPod connectivity. The Limited includes everything listed as optional on the Sport trim, plus auto-dimming exterior mirrors, dual-zone climate control, heated second-row seats, power-adjustable pedals, driver-seat memory and remote engine start. Xenon headlights and a rear-seat entertainment system are optional on the Limited, as are adaptive headlights and various towing packages. A chrome exterior package is also available for all 2010 trims. 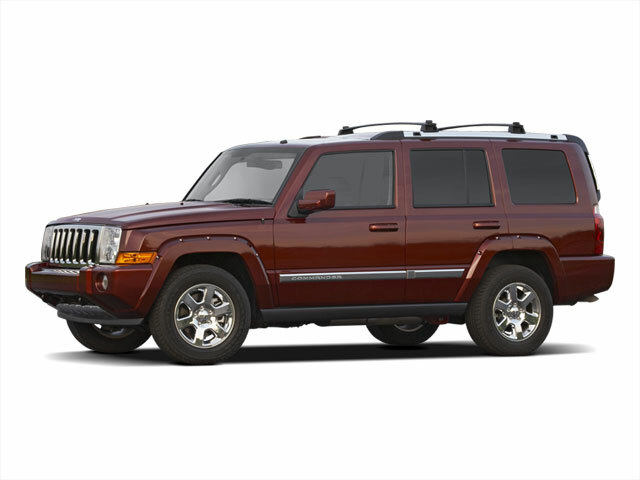 As the first Jeep ever to seat seven, the Commander is the largest vehicle in the lineup. Properly equipped, the V8-powered rear-wheel drive Commander Limited can tow up to 7,400 pounds, while the V6-powered rear-wheel drive Commander Sport can tow up to 6,500 pounds. It competes directly with the Toyota 4Runner and the Honda Pilot. MSRP starts at $31,575. Fuel economy is estimated at 15 mpg city and 20 mpg highway.